The first round viewing of the jumper stallions has led to an interestingly bred, diverse group of stallions. 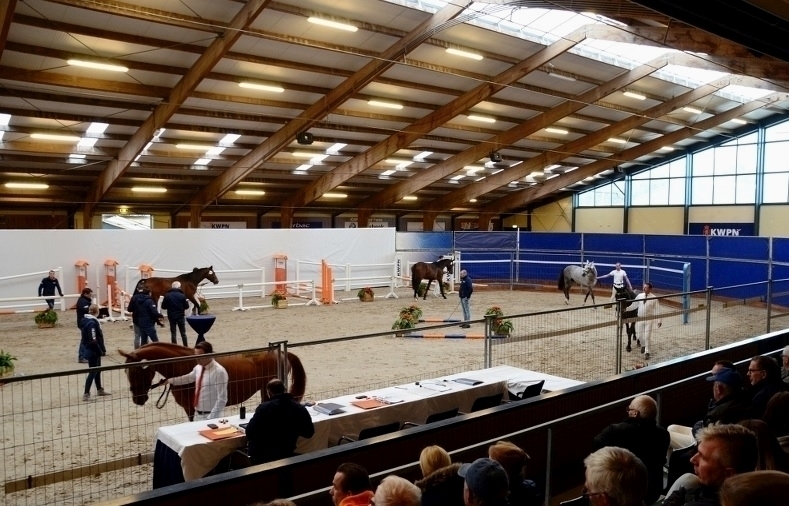 For eight days, stallions could be selected for the second round viewing that takes place at the KWPN Stallion Show in ‘s-Hertogenbosch. In terms of descent and type the first day was very varied. Of the eight presented Kannan sons four are allowed to go to the second round viewing, and also the Grand Prix stallion Quickly de Kreisker did get two sons through. "It was quite a good day today. We had few cancellations and we had a couple of interestingly bred stallions with good performances in the arena ", says stallion commission chairman Cor Loeffen. "On the hard surface this morning, which is laid exactly the other way around as last year, we have noticed a number of abnormal leg dispositions. For some stallions that was an obstacle to go to Den Bosch. A clear plus is that we have seen many youthful stallions. And the majority of them could be judged very well. Of course all stallions are prepared but we have not seen many stallions that jumped forced or with clear lack of confidence." Also on the second day the score came to 15 jumper stallions. It was a very diverse group of stallions with height ranging from 1.59m to 1.76m, and very mixed bloodlines. "The second day we started off better on the hard surface than the first. We had fewer comments to make about the foundation, but we did have quite a few small horses, and by that we mean stallions under 1.64m ", says committee chairman Cor Loeffen. "With those smaller horses we paid extra attention to the canter and the stretch in the body. We also had a bunch of generously developed horses, some of which made a somewhat heavy impression and we clearly selected on that. We are looking for stallions with athletic ability and good reflexes. " The stallions Arezzo VDL and Verdi both had two sons through. The third day was the day of Cornet Obolensky and his (indirect) offspring, among others. His son Cohinoor VDL saw all six presented sons come through tot the second round viewing, the Cornet-son Comme Il Faut got six and also a direct son of Cornet Obolensky was selected. "We have seen modern sons of Cohinoor, which jumped well with good reflexes and attitude," explains committee chairman Cor Loeffen. "It was a good day, we have seen a bunch of better horses what gives us good hope for the continuation of this stallion selection. Just like the previous two days, we saw some horses again with a somewhat small height that jumped very well and thus deserved the invitation for Den Bosch. " ​The fourth day was a day without real highlights. "But a bunch of interesting stallions to continue with. From Etoulon VDL we have been able to select a few fine, riding type sons. Very appealing horses that could gain some strength. We also had several sons of Diamant de Semilly, who were very diverse in type. We have been able to designate three modern sons for Den Bosch, they jumped with good reflexes", according to Cor Loeffen. "In addition to Etoulon VDL, we have seen great sons from other E-year stallions, such as from Edinburgh and El Salvador." On this day seven Gelder stallions also came into the arena. Three were given the green light for Den Bosch, descending from Edmundo, Guardian S and High Five. On the second to last day of the regular inspections, there were again no major highlights. "We were able to select twelve stallions that we would like to see back in Den Bosch. Among them four sons of Glenfiddich VDL, from a group of twelve. Generally, they were sons with radiance, a strong powerful canter but quickly distracted when jumping. As a result, the overall impression was variable. Even on the hard surface this morning they were already whinnying, so that was also at the expense of the focus when jumping. We often missed the technique and reflexes during this whole day ", says Cor Loeffen. On the last regular first viewing day, the jury could add 16 more stallions to the Den Bosch collection, which brought the total to 86. Among them are four sons from the first year of Grandorado TN. "It was an interesting last day", says Cor Loeffen afterwards. "And that's what the breeders thought, because there was a lot of interest for the sons from the first years of young stallions. Also positive was that from actually all young stallions we were able to take one or more sons to the second round viewing. "Among them four sons of Grandorado TN who had the most sons in this selection. "What was positive about the sons of Grandorado TN is that he inherits height and development, and they seem to have a lot of power. From Gullit HBC we have selected two sons who made a good impression on all jumping competences. We also selected sons from young stallions such as Heineken UK VDL, Homerun, High Shutterfly, Hotspot and Hermantico. In addition, also a direct son of Heartbreaker." Hereafter follows only the after-inspection that will take place on 10 December.